Providing you the best range of fully automatic roller table machine and fully automatic power roller table machine with effective & timely delivery. 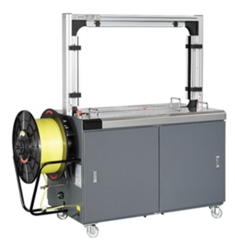 The Fully automatic strapping machines provided by us are developed with state-of-the-art innovative designs. These are compact and assembled for lightweight to ensure easy mobility. This machine is fitted with a concise, low maintenance sealer head. The Fully Automatic Power Roller Table Machine is designed with different innovative designs.Its is design for light weighting having heavy mobility. This machine is fitted with a concise, low maintenance sealer head. Simply place your item on a strapping on the table, feed the strap around the item and into the strapping head, which hits a trigger.